I’ve now taught the BHP course enough times with enough students to be able to develop my own short list of favorite activities. Although it’s true that these activities do a great job of illustrating difficult concepts and generating great discussion, they also have this in common: I get a lot out of them—every time. I have to remind myself that because we—the BHP team working with us, the growing community of BHP teachers—are constantly adding new activities and tweaking old ones, this list will always be a work in progress. 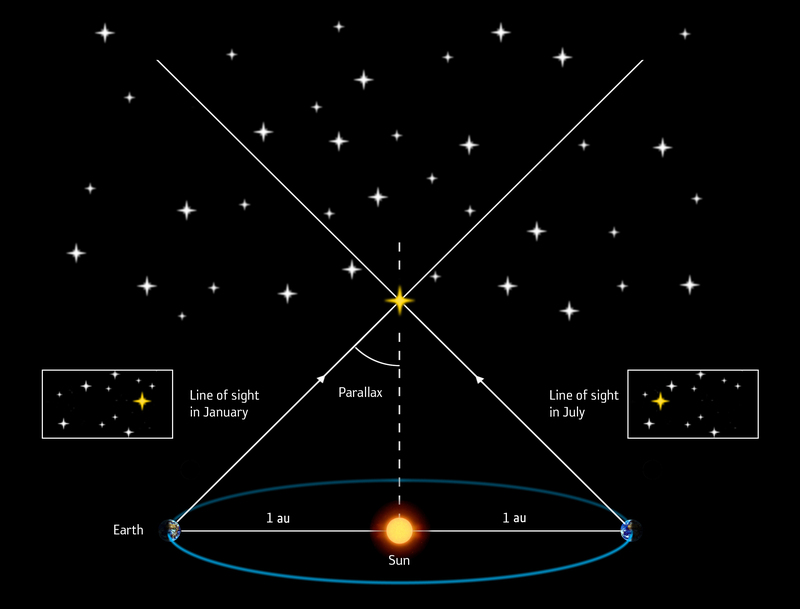 One of my short-listers is Lesson 1.4’s Measuring Distance Using Parallax, in which I take my students out onto our school’s football field and ask them to calculate the distance from three or four “planets” (cones that I’ve set up) to a distant “star” (the school’s flagpole). My students are high-school juniors and seniors and they have a lot of math under their belts, so most of them have already learned something about parallax in a math class. Most of them, though, have only an academic knowledge of parallax and haven’t actually applied the technique. I really like this activity because it shows students (and reminds me) that there’s a real-world application of parallax. What intrigues me about measuring big distances using parallax is a combination of the results themselves and what those results might have told people in the ancient world about their relationship to distant objects: Did the results make these objects seem closer or farther away, I wonder? But I think I am even more intrigued by the amazing creativity that the development of this technique required of our ancestors. I’m not sure we’ll ever be able to identify who first used parallax to measure the distance from the Earth to a faraway object, but the technique is a testament to the incredible ingenuity of humans as problem solvers. This parallax activity isn’t without its challenges. It’s not easy to create an accurate protractor to do the activity’s calculations, but ask around—you might have math colleagues who have ready-made protractors that they’re willing to lend. Also, based on my students’ experiences, the numbers won’t come out perfectly—students will likely struggle to get their baseline at a precise 90-degree angle to the line from the “planet” to the “star,” and they will also likely struggle to precisely measure the angle in their imaginary triangle. However, working around these issues will give them greater insight into the challenges that faced the early developers of the technique. 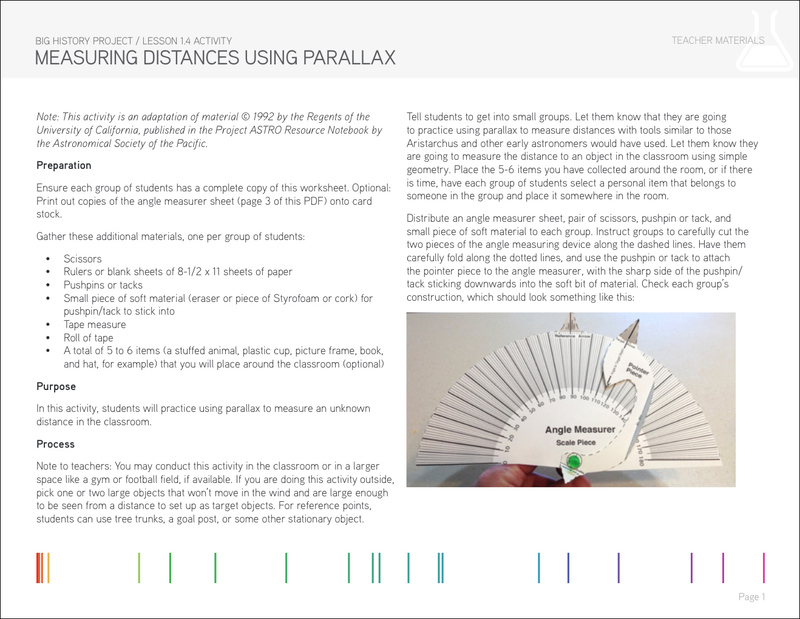 Measuring Distance Using Parallax illustrates the concept of parallax in a tangible way that kids will likely remember. Just as important, it highlights two of BHP’s big ideas: thinking across scales and collective learning. Interested in discussing this Lesson 1.4 activity? Comment here or join the conversation in the Unit 1 group on Yammer. Wow David what a great blog! I tried the parallax activity indoors (as activity suggests) and found it really frustrating. I think outdoors using much greater distances would’ve solved a lot of my frustrations. This is a really great point about academic vs. hands on knowledge. Its like the difference between reading a textbook and going to an archive. Great stuff!